From AM to PM – Milieu de la Moda, Inc. Jeans, t-shirts, jumpers…these are the items of clothing that usually take up most of the average person’s wardrobe space. Well not mine! I don’t know how it happened, but when you slide open my wardrobe doors, there are a plethora of crop tops and bralets in all shapes and sizes taking over my wardrobe, and it’s not even Summer yet! Note to self: Stop buying crop tops. 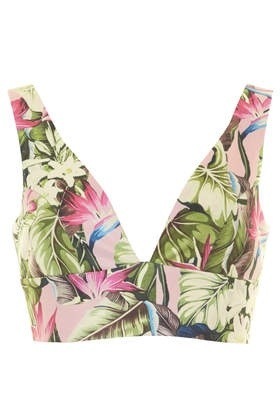 On my last shopping trip, I stumbled across a bralet in Topshop that really caught my eye. It was a Deep V bralet with a tropical print. (This bralet also comes in an off White and Black.) So anyway, I just HAD to try it on.